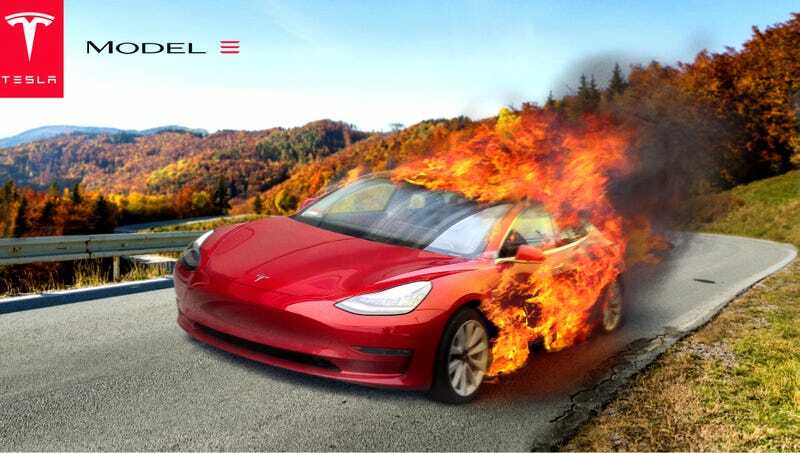 PALO ALTO, CA—Boasting that drivers and critics alike would be awed by the car’s pyrotechnic performance, Elon Musk announced Tuesday that every new Tesla Model 3 sold would be capable of going from zero to engulfed in flames in just 3.5 seconds. “The Model 3 is the most efficient, fastest-burning passenger car available for under $40,000,” said Musk, noting that while previous models needed at least five seconds to reach total combustion, the updated “Ludicrous Temperatures” mode in the Model 3 sends flames shooting through the passenger cabin mere moments after the driver steps on the gas pedal. “Our engineers have designed an innovative, highly responsive, fully electric vehicle that we’re confident in calling the most volatile in its class. Once the fireworks start, Tesla’s unique combination of chemical and electrical flames are three times as persistent as archaic gasoline fires. And the Model 3’s increased range gives our customers the freedom to incinerate themselves farther from home. In these uncertain times, we’re confident in saying the Tesla Model 3 is truly the car of the future.” Tesla’s new line of semitrucks is reportedly expected to explode onto the freight-hauling scene in early 2019.